Hello there. 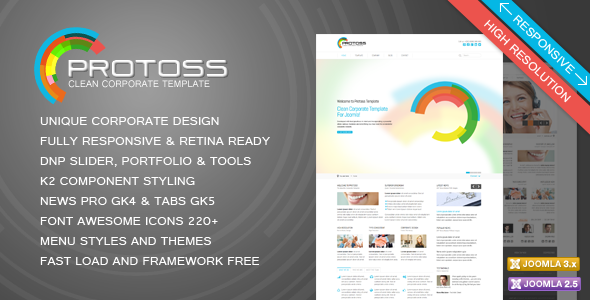 This is Protoss, a clean and beautiful corporate template for Joomla! 2.5 and Joomla! 3.0 featuring a fully responsive and retina ready design. Protoss also features K2 Component with fully responsive design and a unique look and feel, DNP Slider – the best responsive slider for Joomla! 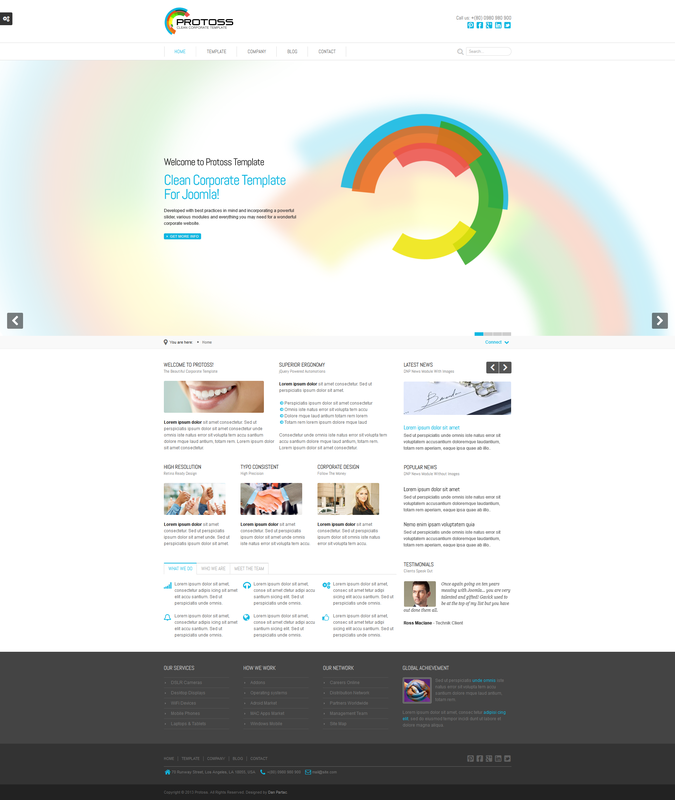 and DNP Portfolio the best responsive portfolio/media filter for Joomla! The template loads fast, avoids compatibility issues, it’s framework FREE and fully responsive. It comes with REAL Quickstart Installation Package for Joomla! 2.5 and Joomla! 3.X (a clone of the demo), various extensions and PSD Sources for various graphics used on the demo site. Please note that some images are replaced with watermarked images. I am constantly updating all my templates so please download the latest vrsion on your downloads page and check the changelog in the documentation. Framework FREE Template – here a RESPONSIVE template far from headakes and trouble with light coding and pretty much perfect. DNP Slider Module – The Best RESPONSIVE Slider for Joomla. It’s Awesome! DNP News Module an easy way to show your blog items and news just like you did with News Show GK4. This feature is Joomla 3.X only. DNP Portfolio Module a powerful and RESPONSIVE portfolio filter powered by jQuery Isotope. The Joomla 2.5 version supports videos too! K2 Content Component Support with beautiful template overrides and unique customizations. This feature is Joomla 2.5 only. AJAX Search Module with a unique look and feel. This feature is Joomla 2.5 only. Unique Login Register Popup Module witch reCaptcha. This feature is Joomla 2.5 only. News Show Pro GK4 Module. This feature is Joomla 2.5 only. Tabs GK5 Module. This feature is Joomla 2.5 only. 5 color variations: blue, green, red, yellow and orange. 220+ Icons by Font Awesome. Custom error and offline pages RESPONSIVE. jQuery 1.8 minimized included & running in “noConflict()” mode for various template features. A full features list is available on the demo site here. Multi-slide: for each slide you can set 3 animations, one for the main image, and 5 more sequences. Swipe Navigation for mobiles only. 3 animation types for slide image. CSS3 animations for slide content with randomize option. 12 amazing animation types for slide descriptions with randomize option. Unlike others, this baby is cross browser compatible, does not crash on window resize and really is the best! The module version for Joomla 2.5 works with K2 Component Only. The module version for Joomla 3.x works with com_content Component Only. Automated grids based on window width, this makes it absolutely unique and most powerful. Allows you to filter portfolio items by category and item title. Multi-themes feature, you can make your own template overrides with your desired functions. Can work with Videos too, you just need to use the new “media” theme. This feature is Joomla 2.5 and K2 ONLY. Works with Joomla 3.0 only and replaces the good old News Show Pro GK4. The module is an extension of the core mod_articles_news module. It allows you to show images of your desired dimensions. It allows you to show/hide the item intro text and title. Allows you to set a character limit for the text and the title. Allows you to show/hide “Read more..” button. Remember I am the man behind the T3 Framework Wikies and video tutorials, I can provide the best support. To get access to support, first you have to send a message via profile page here. You will receive an e-mail instructions in less than 12 hours. Antares Template for Any Website !! Featuring a flexible fully responsive design, unique layouts, unlimited styling possibilities, the best responsive slider for Joomla called DNP Slider and the best portfolio/media filter called DNP Portfolio. Check it out now! Galaxy Responsive Template for Corporate Clients !! Featuring fully responsive and clean design, the best responsive slider for Joomla called DNP Slider and the best portfolio/media filter called DNP Portfolio. Check it out now! Featuring a modern and fully responsive design in light and dark version, with multiple layouts and background patterns, the best responsive slider for Joomla called DNP Slider and the best portfolio/media filter called DNP Portfolio. Check it out now! Mt first template on Themeforest featuring a cool design with consistent typography and later coming with many goodies. Check it out now!